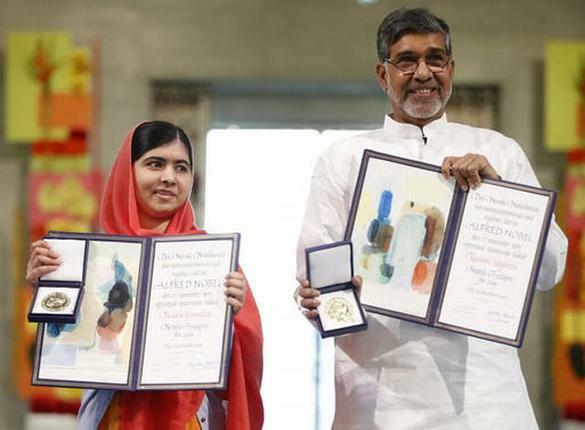 Malala Yousafzai and Indian child rights campaigner Kailash Satyarthi have received the Nobel Peace Prize awards. The Nobel committee described both laureates as “champions of peace”. The Pakistani education activist said she was there to stand up for the rights of forgotten and frightened children, and raise their voice rather than pity them. Kailash Satyarthi said receiving the prize was “a great opportunity” to further his work against child slavery. Malala Yousafzai and Kailash Satyarthi received their awards from the chairman of the Norwegian Nobel committee, in the presence of King Harald V of Norway. In her speech, Malala Yousafzai, 17, said the award was not just for her: “It is for those forgotten children who want education. It is for those frightened children who want peace. It is for those voiceless children who want change. Malala Yousafzai was shot in the head by Taliban gunmen in October 2012 for campaigning for girls’ education and now lives in the UK. “I will continue this fight until I see every child in school,” she added. In his speech earlier, Kailash Satyarthi, 60, said he was “representing the sound of silence” and the “millions of those children who are left behind”. “There is no greater violence than to deny the dreams of our children,” he said. “I refuse to accept that the shackles of slavery can ever be stronger than the quest for freedom,” he added, to applause. Thorbjorn Jagland praised Kailash Satyarthi’s work campaigning against child labor, often at great risk to himself. Malala Yousafzai and Kailash Satyarthi were jointly awarded the 2014 Nobel Peace Prize “for their struggle against the suppression of children and young people and for the right of all children to education”. Malala Yousafzai and Kailash Satyarthi have split the $1.4 million prize money.